PURE SURF TIME, NO SILLY BEACH GAMES THROUGHOUT OUR SURF LESSONS. Long Beach: Classes take place on Pacific Boulevard at Shore Road in Long Beach, NY on Long Island. The City of Long Beach charges $15 per person (12 and over) for beach admission. 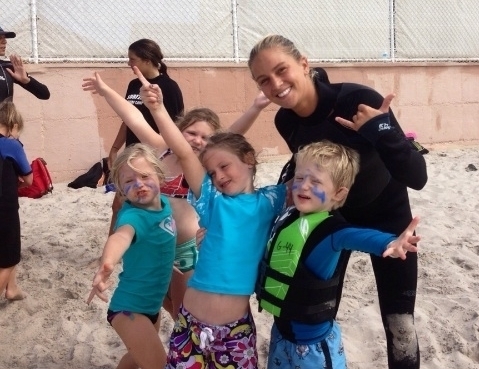 The cost of your SURF2LIVE lesson includes soft surfboard, wetsuit and rash guard. Please download the release forms prior to your scheduled classes. We want to cater to your specifications and we'll bend over backwards to make your event not only special, but perfect and perfectly run. Whether you're after a surfing birthday, private party or corporate outing, we'll make it happen and surpass your expectations. Our parties are held on a beach that is not crowded and your guests will enjoy the surfing and relaxing experence that you want to share with your them. Our parties are fully inclusive and we take care of everything, this is a must, do not depend others, we do these parties all the time and know what you want, it is hassle free and will be the talk of the town. Also a huge cost saving event, forget about golf or other events that will cost you more money than you want to spend, call us to get all details.